Defend Trade Secrets Act of 2016 Handbook is a “must have” resource for anyone who needs to know how this new law will affect trade secrets litigation. In one comprehensive volume it provides all the necessary analysis, primary source material and forms to jumpstart your knowledge of this new statute and its implications. The Defend Trade Secrets Act of 2016 (DTSA) has been touted as the biggest legal change in intellectual property law since the passage of the Lanham Act in 1948. It creates a new federal cause of action for trade secret misappropriation. Now for the first time, litigants can bring a cause of action in federal court without asserting diversity or concurrent jurisdiction. Written by four leading trade secret practitioners, the publication provides authoritative content so that you can confidently navigate the new legal landscape under the DTSA. Defend Trade Secrets Act of 2016 Handbook covers every aspect of the new law, and most importantly not only intricately analyzes the DTSA, but puts it within the context of the existing law. It begins with an overview of U.S. trade secrets law so that you get an understanding of how the law evolved and the how this new law relates to the current body of trade secrets law. It then delves deeply into the Economic Espionage Act (EEA) and the most recent amendment to this statute, the DTSA. The analysis continues by covering the Uniform Trade Secrets Act and its nexus to the DTSA and EEA. 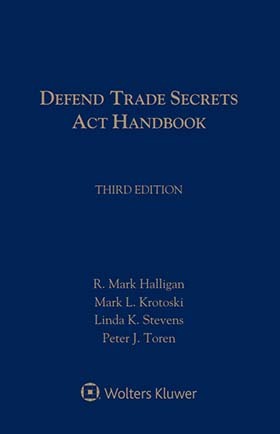 The book then goes on to provide detailed coverage of every aspect of the DTSA and litigation under the new act – from the definition of a trade secret to the new ex parte seizure order (how to obtain the court order, the court hearing, damages for wrongful and excessive seizure, and more). It also covers remedies under the DTSA, immunity for whistleblowers and litigants, defenses to civil claims under the EEA and other important litigation issues, such as determining where to sue, possible causes of action, discovery issues, criminal remedies and RICO predicate offenses. The appendices contain helpful sample forms and checklists, a table of Section 1832 cases under the EEA dealing with the theft secrets from its enactment in 1996 through 2015. Also included is the text of all of the relevant statutes and legislative history of the DTSA so that legal practitioners have all the necessary resources at their fingertips. [C] Section 2. Injunctive Relief. [E] Section 4. Attorney’s Fees. [F] Section 5. Preservation of Secrecy. [G] Section 6. Statute of Limitations. [H] Section 7. Effect on Other State Law. 9.01 Where to Sue: State v. Federal Court? 9.03 Who Can Bring Suit & Who Can Be Sued? 9.10 What State’s Law Applies? 9.11 Will Irreparable Harm Be Presumed?